We’d love your help. Let us know what’s wrong with this preview of Ayesha Dean - The Seville Secret by Melati Lum. To ask other readers questions about Ayesha Dean - The Seville Secret, please sign up. Ayesha Dean can’t wait to move on to her next investigation following the dramas and dangers of the Istanbul Intrigue. Undeterred, her passion for becoming a detective is undiminished – rather enhanced – as she heads off to Seville for a ‘holiday’ with her close friends Sara and Jess under the not-very-watchful eye of her guardian uncle. In ‘Ayesha Dean and the Seville Secret’ the author Melati Lum, a lawyer, has drawn out the characters . Ayesha is a little older and wiser, though not too much to avoid the dangers she throws herself into and which makes her adventures such a ‘page turner’. Lum’s writing style has also developed (‘the wooden door behind her flew open to connect with the stone wall’ rather than ‘the door banged open’)) – the plot is tighter and the writing style less literal. Ayesha Dean’s world is already a darker, scarier place. She is learning no longer to trust outward appearances, but has not yet acquired the literary detective’s natural suspicion of everybody. She also enters a world of organised crime, murder and guns – all of which she realises are elements of what she must learn to deal with if she is to become a detective. The risks are greater and schoolgirl japes have turned serious. Like all good super-heroes, Ayesha has also been honing her special skills to deal with the enhanced threat – hers are martial arts and a course in lock picking - both of which are used to good effect in unravelling the Seville Secret. What has not changed are the sunny dispositions of the main characters, Ayesha’s Islamic faith that is tried on many occasions, and the fashion consciousness of the three teenage girls whose outfits are recorded in great detail – ‘if you are going to be a detective look good’ is the message – Ayesha Dean is not so much the dowdy Miss Marple as the fastidious Hercule Poirot and like the famous French detective food is high on the agenda. As with the Istanbul Intrigue, in the Seville Secret Ayesha Dean is drawn into a world of corruption, greed and hidden treasure. This allows a wider context to be explored - in this case the forced expulsion of the Moriscos (the Moors) from Andalusia, Spain. Ayesha is also growing up and is nearly, but not quite, falling in love with the handsome young Kareem whose grandfather’s disappearance has prompted the investigation. Ayesha puts aside romantic possibilities to focus on the task in hand – but this is a clever echo of the love affair that lies behind the ‘hidden treasure of incalculable value’ that everybody is hunting and is prepared to kill for. As with the Istanbul Intrigue, all the threads are pulled together but not without many twists and turns and it is a palpable relief when Ayesha emerges relatively unscathed, but with more experience and wisdom to begin her next adventure. Maybe entering the world of guns will require her to learn how to handle her firearms skills – but how will she reconcile that with her faith and passion for 12th century Sufis, such as Ibn Arabi and Ibn Hazm, whose work centres around compassion and tolerance? As a grandfather myself - Ayesha feels like a granddaughter making her way in life, I can’t wait for the next instalment! This is the second middle grade mystery story for globe trotting sleuth, Ayesha Dean, and much like her first adventure in Istanbul, this Spanish setting is infused with rich history, delicious food, relatable characters and quick paced action. Once again Ayesha and her two friends Jess and Sara are tagging along on a business trip with Uncle Dave, Ayesha's uncle who has raised her since her parent's passing. As they wait in line to board the final flight of their lengthy journey from This is the second middle grade mystery story for globe trotting sleuth, Ayesha Dean, and much like her first adventure in Istanbul, this Spanish setting is infused with rich history, delicious food, relatable characters and quick paced action. Once again Ayesha and her two friends Jess and Sara are tagging along on a business trip with Uncle Dave, Ayesha's uncle who has raised her since her parent's passing. As they wait in line to board the final flight of their lengthy journey from Australia, a young man drops his contents and Ayesha and him chat, later they are seated next to each other on the plane where he discloses his travels from England to Seville are to help locate his missing grandfather. Ayesha volunteers herself and her friends to help him and they hit the ground in Spain determined to solve the case. The boy, Kareem, is staying with the friends his beloved grandfather was staying with when he went missing, so that is where the detectives start their work. In searching his room, Ayesha uncovers a 400 year old diary written in Arabic, and a pamphlet from the Archeology Museum with a necklace circled, the Collar de Pajaros. Just enough to get them started and set their adventure in motion. The group of teens rely on Kareem to translate the Arabic in the diary and Ayesha's wit to decide what to follow up on and how to incorporate their sightseeing with the task at hand. As they journey through the city of Seville, learning the history and tasting the food, nefarious characters start to notice the group and things get intense. From Cathedrals, to cafes, to Museums, and even to an ancient city uncovered in Cordobo, Madina Al-Zahra, the chase is on, not only to find Kareem's grandpa, but to also avoid being caught themselves and maybe even solving a centuries old mystery about treasure and a necklace along the way. I love that Ayesha in any situation stays true to her self. She wears hijab, she prays, she is aware of the good looking guy, but doesn't cross her own line, she is a good friend, an inquisitive person, and confident. All amazing attributes for a fictitious hero and real ones too. Much like Nancy Drew and other middle grade novel series, the books don't need to be read in order, and while they reference other adventures, they stand alone sufficiently too. Also, like the aforementioned books there is definitely a formulaic pattern to how the author writes her books. And while reading it I didn't notice it intensely, as I write the review I do. Ayesha travels abroad, she has her sidekicks that are not developed at all and truly have no barring on the story plot wise or as comic relief, they are simply foils to bounce conversation off of, there is a cute boy who could be pursued, but isn't, someone passes out while she and her friends are sight seeing, and the spouses provide added clues, Ayesha gets locked in a small dark space, there is a twist and a surprise, a trap, and they all live to repeat the adventure in another city another day. I don't think I have a problem with it, but maybe because I am not the target audience age, I might get bored with it about book four or so. As it stands right now, I'm anxiously waiting for book three. While reading I was a little irked that Sara and Jess weren't any more developed in Spain than they were in Turkey. One of them could have been the one to administer CPR or to stumble on the diary in the room, something to give them some plot significance, but alas, the books do not bare their names. I wish Kareem would have at least said "Salam" on occasion. I like that the author shows he doesn't know much about Islam and shows that his grandfather admits its been so long since he has prayed, but the boy is a Morisco and his parents immigrants from Algeria, he translates Arabic, he should say Salam when he meets Ayesha in her hijab wrapped head. The author does a much better job in this book staying with the characters and showing the city through their eyes rather than pulling them out of their scenes to convey something. Only once at the end of a chapter did I feel there was some forced foreshadowing that was not needed, as the book is quick and chapters may end, but the pages still turn until the end is reached. I had more trouble putting the book down than picking it up, and that is saying something as I read it online and I definitely favor physical books. I wish there was an afterword or author's note explaining what was real and what was fiction. I googled Madinat al-Zahra and found it fascinating, but couldn't find anything in English about the Collar de Pajaros. Also a map or two would be great. None. This book is clean and even the fights are not gory or over the top. Yay! I would absolutely do this as an elementary book club selection, and can't wait to get a copy to my children's school library and their classrooms. The book is an easy read and the history and culture is seamlessly interwoven in to the story that kids will enjoy the action and find they learned something about a culture along the way. I think boys and girls will enjoy it, even if it appeals more to the girls. The cover, the binding, the font is all spot on for the age group and I eagerly await Ayesha's next adventure. Some of my earliest reading memories surround books like Nancy Drew and The Hardy Boys. They leave such a potent nostalgia in me and I'm not sure if that's where my love of reading started but it definitely played a HUGE role. When I was young I would do my best to collect as many books from both series as I could, and my younger brother and I formed a type of comradery while sharing their stories. I haven't picked up a Nancy Drew (or Hardy Boys) mystery in years. However, all of the nostalgia as Some of my earliest reading memories surround books like Nancy Drew and The Hardy Boys. They leave such a potent nostalgia in me and I'm not sure if that's where my love of reading started but it definitely played a HUGE role. When I was young I would do my best to collect as many books from both series as I could, and my younger brother and I formed a type of comradery while sharing their stories. I haven't picked up a Nancy Drew (or Hardy Boys) mystery in years. However, all of the nostalgia associated with Nancy and her crew came rushing at me with Ayesha Dean - The Seville Secret. The Seville Secret is the 2nd book in the Ayesha Dean series, yet you don't have to read the first book to enjoy this one. This sweet, mysterious, and refreshing read stands alone. I actually started reading The Seville Secret with my 9-year-old sister and besides the fact that I enjoyed it, I loved seeing her enjoyment of it as well. The language is simple and perfect for the middle-grade readers that it's aimed for but the story is truly adept at pulling in readers of all ages. I was absolutely delighted by all of the parallels between Nancy and Ayesha and I was reminded all over again just how much I enjoyed reading a good mystery. If you've read Nancy Drew you can see how both Nancy and Ayesha have a token male parental figure who worries for their loved one but doesn't discourage their independence. There are also the two friends, one who is athletic and one who is more dainty. Then there is the sweet and innocent love interest that doesn't pull away from the story, is a true gentleman, and that doesn't venture into any cheeky places. 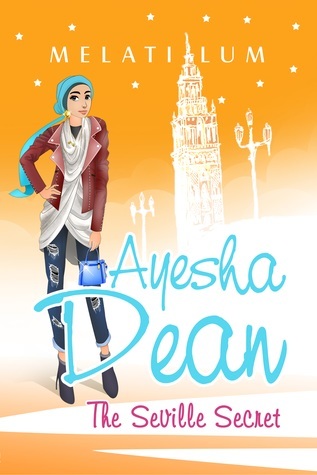 Ayesha Dean is literally the Muslim Nancy Drew that I needed as an 11-year-old looking for characters like me. The Seville Secret is well written and the author, Melati Lum, is truly skilled at including the Moorish history of Spain, Spanish culture, and Islamic representation. The story is rich with beautiful imagery and history. I honestly couldn't help but to close my eyes and imagine some of the descriptions of flowers and nature and make myself hungry thinking about some of the food that was being eaten. I'm not an artist but I swear I thought I could draw a version of the missing necklace that is the center of the story. There's also a part where Ayesha is not able to make wudhuu with water and Lum incorporates her doing tayammum and I was too geeeeked! Ayesha regularly praises Allah and is unapologetically Muslim. One thing that brings me enjoyment is that none of the plot surrounds Ayesha struggling with being a Muslim. She's completely confident in who she is, what she practices, and how she lives. As marginalized people, it's expected that our art and literature reflect the struggle we go through, but sometimes it's refreshing to have a story where the character is just who he/she is. In The Seville Secret, Ayesha goes with friends Jess and Sara and her Uncle David to Spain. He has business to attend to while the girls go on holiday. On the plane, they meet Kareem, who is going to Spain to look for his grandfather, who disappeared while studying some ancient jewels. Ayesha offer The Seville Secret is the second installment in the Ayesha Dean middle grade series by Melati Lum. It follows Ayesha, a hijabi Australian teenager, as she travels and solves mysteries with her friends. In The Seville Secret, Ayesha goes with friends Jess and Sara and her Uncle David to Spain. He has business to attend to while the girls go on holiday. On the plane, they meet Kareem, who is going to Spain to look for his grandfather, who disappeared while studying some ancient jewels. Ayesha offers to help, and adventure ensues. While searching through Kareem’s grandfather’s things, they come across a very old diary. The diary was written during the Spanish Inquisition, and it means that readers are treated to two stories: the sixteenth century tale of a secret Muslim and his relationship to a famous necklace, as well as the mystery of what happened to Kareem’s grandfather. This middle grade novel is both a mystery and an adventure story; there are not only museums and ruins but also fights with bad guys and narrow escapes. This is the kind of book where a child protagonist can use her martial arts skills to get a bad guy to let go of get best friend, where the police share information about an ongoing investigation with a minor, and where she asks the defective with a straight face if there’s anything she can do to help. The Seville Secret is a really fun read and I especially recommend it to parents looking for more wholesome literature for their kids. Ayesha Dean is such a refreshing character. She is independent and confident: I love that she knows that she wants to be a detective, and she takes herself seriously, training in martial arts. She also owns her faith and her hijab, despite being the only Muslim in her house. She takes time out of her day to pray, even while on her adventures. She knows what she wants, and she’s not afraid to go after it. While this book will be especially meaningful to Muslim readers, I can see middle grade readers of all genders and faith backgrounds enjoying this story. Fresh from her adventures in Istanbul Ayesha Dean is ready for her next mystery. Ayesha along with her friends Sara and Jess and her uncle Dave is on her way to Seville, Spain when she meets Kareem. He is looking for his grandfather who has gone missing in Seville and Ayesha agrees to help him. Throw in a centuries old love story and a missing necklace, it's the perfect mystery for Ayesha. But, unfortunately it's not long before her investigation leads her to trouble. Ayesha Dean is a young, ind Fresh from her adventures in Istanbul Ayesha Dean is ready for her next mystery. Ayesha along with her friends Sara and Jess and her uncle Dave is on her way to Seville, Spain when she meets Kareem. He is looking for his grandfather who has gone missing in Seville and Ayesha agrees to help him. Throw in a centuries old love story and a missing necklace, it's the perfect mystery for Ayesha. But, unfortunately it's not long before her investigation leads her to trouble. Ayesha Dean is a young, independent, smart, mystery loving, hijab wearing, devout Muslim. She is a martial artist and wants to be a detective. She's brought up by her uncle Dave and aunt Lily after the death of her parents. She loves solving mysteries along with her two best friends. Seville Secret is the second book in Ayesha Dean series. It shows the three friends trying to solve a centuries old mystery while trying to locate a missing old man in the present time. The past and the present is intricately woven in the story. The historical sites and the history of Spain were beautifully portrayed. And the delicious mouth watering food. The plot moves forward in a comfortable pace with plenty of risk involved. Ayesha's skills were cleverly showcased in this book. She is definitely not a damsel in distress. I wish the author had given something for Sara and Jess to do. They didn't contribute much to the plot and the story would have continued the same way even if they weren't in it. Other than that this book is definitely a great book for a cozy mystery lover. I would like to thank the author for giving me a ARC. I loved this book. It's not every day you come across a book with a Muslim heroine like Ayesha Dean. This book was a breath of fresh air compared to all the books which portrays women as damsels in distress who needs to be rescued from big bad men. Ayesha Dean is a modern day Nancy Drew. This book took me back to my childhood when I read my first Nancy Drew book. It was refreshing to see all the references to Ayesha's Islamic background. This is a book I would want my children read when they grow up In shaa Allah. It is so wonderful to read another adventure of Ayesha Dean, this time in the captivating region of Andalusia, rich in history and mystique, both of which are described beautifully by the author. Ayesha again soon finds herself a mystery to solve with her two best friends involving a missing elderly man and an ancient diary, and the reader is taken on a thrilling ride through castles, museums and historical ruins as Ayesha and her friends piece together the clues to locate a priceless necklace a It is so wonderful to read another adventure of Ayesha Dean, this time in the captivating region of Andalusia, rich in history and mystique, both of which are described beautifully by the author. Ayesha again soon finds herself a mystery to solve with her two best friends involving a missing elderly man and an ancient diary, and the reader is taken on a thrilling ride through castles, museums and historical ruins as Ayesha and her friends piece together the clues to locate a priceless necklace and save their friend’s grandfather. What I enjoyed most about this book was the way Melati Lum interweaves religious experiences of the past and present. The diary extracts detail the difficulties faced by Muslims and Jews during the Spanish Inquisition, yet love blossoms between two individuals despite their different religious and social standing. In the present, Ayesha’s close friendship with her besties Sara and Jess show how they respect and support one another in expressing and practising their respective faiths. Whether it be Ayesha praying her five daily prayers as a Muslim or Sara lighting a candle in a cathedral as a Maronite Christian, religion is an important part of their lives just as it was to those many centuries earlier. Ayesha Dean and The Seville Secret, author Malati Lum’s newest YA novel, in the Ayesha Deen series: This story is about a young woman, Ayesha Dean, who wishes to one day become a detective. Throughout her distant global travels, she comes across people and places that hold many a dark secret. Being the curious sort and a natural sleuth, Ayesha engages her best friends to join her in solving the mystery, and lucky for her, her friends are equally as inquisitive and eager to get to the bottom of t Ayesha Dean and The Seville Secret, author Malati Lum’s newest YA novel, in the Ayesha Deen series: This story is about a young woman, Ayesha Dean, who wishes to one day become a detective. Throughout her distant global travels, she comes across people and places that hold many a dark secret. Being the curious sort and a natural sleuth, Ayesha engages her best friends to join her in solving the mystery, and lucky for her, her friends are equally as inquisitive and eager to get to the bottom of things, despite facing impending danger. I especially appreciated the banter and camaraderie between Ayesha and her two side-kick-friends, reminiscent of the original Nancy Drew Mysteries. However, I found the main character––Ayesha––portrayed as less perfect, less passive, and more true-to-life than the iconic Nancy Drew character. Lum has done more than write an action-packed adventure. She has created a contemporary, coming of age, polished female sleuth willing to bend convention, question authority and gender stereotyping, as well as challenge implicit xenophobic cultural narratives. I’m confident Ayesha Dean and The Seville Secret will engage and satisfy many a YA mystery lover. Thank you to Melati Lum for sending me an eARC of her book in exchange for an honest review. I am super excited to be part of this blog tour as I loved the first Ayesha Dean book and I can’t wait to read more of her adventures in the future! This is the second book in the Ayesha Dean mystery series and I really loved this book even more than the first! I loved seeing how Ayesha, Sara and Jess develop from the first book and we got to see more of their interactions both while they’re solving the m Thank you to Melati Lum for sending me an eARC of her book in exchange for an honest review. This is the second book in the Ayesha Dean mystery series and I really loved this book even more than the first! I loved seeing how Ayesha, Sara and Jess develop from the first book and we got to see more of their interactions both while they’re solving the mystery and just hanging out together. I also loved this mystery even more than the Istanbul Intrigue. Spain is a place I have wanted to visit for a long time, especially to see the Islamic history there and this book has made me long for it even more! This story is steeped in the Islamic history of Spain and I loved how Melati wove this history into the mystery that Ayesha and her friends need to solve. I can tell that it has been well researched. Even the way modern day Spain is described in the books. It’s so vivid from the tourist spots to the food and culture and everything, like her first book, was so well researched that all I wanted to do was drop everything and go and visit the places and eat the food! I also loved that in this book we get to see more of Sara and Jess and their backgrounds. It made them more distinct and well rounded as characters outside of being Ayesha’s friends. It was so nice to see a group of girls who are such great friends and support and love each other yet still make jokes and have fun together. I also want to mention Ayesha’s uncle, Dave, he is such a wonderful character and although we don’t see much of him, what we do see shows that Ayesha has a beautiful, loving relationship with him. In YA it’s not often we get to see parental figures having a great relationship with the protagonist. The story itself was so interesting and intriguing that I didn’t want to put the book down and was reading well into the night. It was also much more darker at times than The Istanbul Intrigue which I liked seeing as solving a mystery, especially one which involves a missing person, can lead to dark secrets. One of the things I love about these books is the way Ayesha’s faith in seamlessly woven into the story. She wears a hijab and prays and her faith is important to her yet she is just your average teenage girl who wants to be work in the police force and become a detective. It makes Muslim women “normal” rather than shown as “other” and I am so thankful for that. Although this book is part of a series each book has it’s own complete arc so while the adventures build on each other they are completely separate stories and separate mysteries that Ayesha solves. I highly recommend picking up this book especially if you enjoy mystery/detective books. Really enjoyed the second instalment of the Ayesha Dean series. I travelled through Seville last year and it was so wonderful to be reminded of the locations we visited once again through Ayesha's adventures. The story is fun, intriguing and captivating, loved the plot, the mystery, and the dialogue between the 3 best friends. Perfect read for tweens, teens and older. Looking forward to the next instalment of Ayesha Dean! I really enjoyed this book. It is a mystery worth of Nancy Drew and a writing style that is of reminiscent of her books, too. Ms. Lum also created a story that celebrates diversity. The characters are close to people of differing races and religions, and their friendships aren't ever questioned or brought up. They're friends; their looks or beliefs or backgrounds don't matter. Actions matter. I loved that. I highly recommend this book for teens and preteens. I got to read this as an advance reade I really enjoyed this book. It is a mystery worth of Nancy Drew and a writing style that is of reminiscent of her books, too. Ms. Lum also created a story that celebrates diversity. The characters are close to people of differing races and religions, and their friendships aren't ever questioned or brought up. They're friends; their looks or beliefs or backgrounds don't matter. Actions matter. I loved that. I highly recommend this book for teens and preteens. I really liked this second instalment in the Ayesha Dean mystery series. The characters, again, were great and more developed. Each of them became more distinct, and interesting. I enjoyed the new side characters that Ayesha met this time in Seville. The mystery was great! I liked the twists and turns, and it was actually kind of frightening, the things Ayesha was put through. I really enjoyed all the talk of Spanish history. I feel like researching even more. I think that’s what’s most great abou I really liked this second instalment in the Ayesha Dean mystery series. The characters, again, were great and more developed. Each of them became more distinct, and interesting. I enjoyed the new side characters that Ayesha met this time in Seville. I think that’s what’s most great about this series - the way Lum interweaves history with an interesting mystery to solve. It will definitely intrigue younger readers to find out more, and delve into more histories - which is so important for young readers. The more they learn about the past, the more they learn about why the world is the way it is, and why it’s leading where it is. I love that a lot. And I highly recommend these books be put into school libraries. Ayesha Dean — The Seville Secret is the next tome in the cozy mystery series of Australian author Melati Lum. Like Ayesha Dean – The Istanbul Intrigue , book two is also a pleasantly fast read. Ayesha and her friends Sara and Jessica befriend a young man whose grandpa is in trouble. Once in Spain, the girls lend the young man some help to resolve the mystery surrounding his family. This leads them to admire and discover the landmarks in the cities they sight-see, witness the culture and most imp Ayesha Dean — The Seville Secret is the next tome in the cozy mystery series of Australian author Melati Lum. Like Ayesha Dean – The Istanbul Intrigue , book two is also a pleasantly fast read. Ayesha and her friends Sara and Jessica befriend a young man whose grandpa is in trouble. Once in Spain, the girls lend the young man some help to resolve the mystery surrounding his family. This leads them to admire and discover the landmarks in the cities they sight-see, witness the culture and most importantly for me, savor the local food! I happily made Churros while reading this book, and you won't regret doing the same as it was a good reading companion. In Ayesha Dean — The Seville Secret, Ayesha upgrades her sleuthing skills. We also find out that Dean can be an Imam and an Accountant with a penchant for the right kind of asceticism. Furthermore, she is a good ambassador of Islam. This is demonstrated by her nice manners such as her willingness to help anyone who asks to pitch in. Dean's subtle devotion to her faith is a great plus. Thus, her non-Muslim uncle and friends Sara and Jessica have no issue with Islam. Now, because Ayesha is still young, her uncle doesn't completely appreciate the fact that she puts the lot of them in danger, and we can understand his concerns. She is dealing once again with unsavory gangsters. Ayesha reassures him to be more careful and takes the necessary precautions to avoid causing harm to herself and her friends. The latest addition to the Ayesha Dean series follows our detective hero to Seville for some much needed vacation... that is until she meets a man on the airplane with a brand new mystery for her to solve, and she can't help but get involved. There is plenty of historical fiction thrown into the well-described imagery of the amazing setting. There is much to like in this book, and it really gives you a taste of different cultures. The strong female lead is nice, and it provides great perspective The latest addition to the Ayesha Dean series follows our detective hero to Seville for some much needed vacation... that is until she meets a man on the airplane with a brand new mystery for her to solve, and she can't help but get involved. There is plenty of historical fiction thrown into the well-described imagery of the amazing setting. My blog, YA Book Corner, is part of the The Seville Secret Blog Tour. I'm so excited to finally share my review of this fantastic book by Melati Lum! Melati Lum returns to the world of Ayesha Dean to take middle grade readers on a new, exciting adventure through Seville, Spain! The second book in the Ayesha Dean series is titled The Seville Secret and is just as thrilling and fun as its predecessor, The Istanbul Intrigue. Ayesha Dean: The Seville Secret will appeal to anyone looking to explore be My blog, YA Book Corner, is part of the The Seville Secret Blog Tour. I'm so excited to finally share my review of this fantastic book by Melati Lum! *Thank you to Melati Lum for sending me an e-ARC in exchange for an honest review. I thoroughly enjoyed the book. Looking forward for my re adventures of Ayesha Dean.